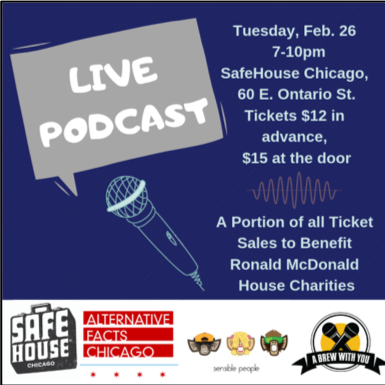 Join three of Chicago's top podcasts for a one-night only special event at SafeHouse Chicago. Featuring Alternative Facts Chicago, Sensible People, and A Brew With You. SafeHouse Chicago - Glowing nightclub & restaurant with spy-themed environs, many bars, upscale bar fare & dancing.